Not to be confused with Rogaine (drug). The standard international orienteering symbol is used to designate a checkpoint on rogaining courses. Rogaining can trace its roots back to 1947 when the first of many events with some of the features of rogaines was organized by the Melbourne University Mountaineering Club. The events from the 1940s eventually led to the birth of the sport of rogaining in April 1976, in Melbourne, Australia. The sport was named, rules were adopted and the world’s first rogaining association was formed (the Victorian Rogaining Association). Growth of the association and the sport occurred rapidly over the next decade. The word rogaining is derived from the names of three of the founders, Rod Phillips, Gail Davis (née Phillips) and Neil Phillips (RoGaiNe, hence 'rogaining', 'rogainer' etc.) who were all members of the Surrey-Thomas Rover Crew which organized the world's first rogaine. 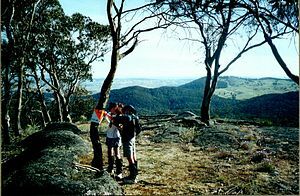 The name was formally adopted by the Victorian Rogaining Association at its inaugural annual general meeting in August 1976 and accepted by Scouts Australia and University bushwalking groups to give the new sport an identity in its own right. World Rogaining Championships were first held in 1992, and then every two years from 1996 to 2012. Since then they have been held annually, with the country chosen two years in advance by the International Rogaining Federation. As of 2017 this has changed back again to every two years. Teams of two to five members visit as many checkpoints as possible in the time allowed. Shorter duration rogaines often allow solo competitors. Checkpoints are scored differently depending on level of difficulty in reaching them; therefore teams choose a strategy (for example, to visit many low score checkpoints). Teams travel entirely on foot, navigating by map and compass between checkpoints in terrain that varies from open farmland to hilly forest. A central base camp known as a "hash house" provides hot meals throughout the event and teams may return at any time to eat, rest or sleep. Teams travel at their own pace and anyone from children to grandparents can experience the personal satisfaction that comes from cross-country navigation at their own level of competition and comfort. Team members stay within earshot of each other. The duration of a championship rogaine is 24 hours, but shorter variations such as 3-, 6-, 8-, 12- and 15-hour events are also held (sometimes concurrently with a 24-hour event). Depending on the terrain, experienced rogaining teams can cover more than one hundred kilometers over the 24-hour period. There have also been longer events (dubbed "Endurogaines") lasting 48 and 50 hours. In their native Australia, rogaines are usually held every month during weekends near full moons, with annual state championships and an annual national championship. They require dozens of volunteers to run, including course setters and caterers and are often attended by hundreds of participants. A competitive 24-hour rogaine requires a map area of around 250 km2 (c. 100 mi2), for relatively flat terrain; terrain with significant climbs may require far less or far more area, depending on the placement of checkpoints. Rogaine control placed on a small knoll. While some controls can be relatively easy to spot, many require careful navigation to locate. Metrogaine: An event of usually around 6 hours and held in predominantly urban areas. Cyclogaine: Usually run for six hours in areas with trails suitable for mountainbiking. Snogaine: Held in areas that are snowbound and participants may either snowshoe or ski to reach checkpoints. Paddlogaine: A rogaine on a water covered area, such as a set of interconnected lakes. Participants can generally use any human-powered watercraft. ^ Phillips, N.; Phillips, R. (2000). Rogaining Cross-Country Navigation. Outdoor Recreation in Australia. ISBN 0-9593329-2-8. ^ Which Way's North?. Victorian Rogaining Association. 2010. p. 5. Archived from the original (PDF) on 2011-03-01. Retrieved 2010-03-08.